You are free to use (or change) this notebook for any purpose you'd like. However, please respect the MIT License that governs its use, and for copying permission. I have been receiving requests to release the Python code I wrote to produce the financial network discussed in my blog post at erikafille.ph titled PSE Correlation-Based Network. Here it is. Set up the correlation matrix for the stock prices in the Philippine Stock Exchange. Convert the resulting correlation matrix into a distance matrix. Build a minimum spanning tree from the distance matrix. I got the link to the data from this stock forum post. In this post it says Drop Box: 2006-present worth of CSV files uploaded by Mr. Coelacanth. The last I checked, the 2016 historical dataset is only until the 15th of July. We first load the list of companies in the PSE and store it in a Pandas data frame we call pse_companies. Then, load all files under the folder "2016" to load all 2016 data. Each file inside a folder contains the prices of all stock quotes in the PSE for the day (as indicated in the filename). As mentioned, the dataset I have for the year 2016 only runs until the 15th of July. The cell block below loads all files in the directory "./2016/". Let's now explore the content of a file (stock prices for 1 day) inside the directory (folder). I am not exactly sure what the last two columns are, so I'm assigning them the variables X1 and X2, respectively. After my initial data exploration, I made a list of companies I am discarding in this analysis. I am also excluding the indices. In any case, you may add or delete stocks to your liking. In the variable subset below, we further filter the dataset by date range. Here, I only want to look at the prices from January 01, 2016 to the end of July. I then reshape the data frame subset and store it in the variable final_df where the columns are the assets and the rows are the prices of the assets on a particular day. From the data frame above, we now build the correlation matrix. In finance/stock trading, **correlation** is just a measure of the extent at which two equities behave with respect to each other. Below, we build the correlation matrix from final_df and store it in the variable price_corr. The matrix provides us with the corresponding correlation coefficients (-1.0 to +1.0) for all stock pairs in the list of companies. Straightforward, isn't it? When two assets are positively correlated, it means that the general trends of the two stocks are similar; when one goes up, the other one goes up as well. When, on the other hand, two assets are negatively correlated, their trends go in opposite directions. I made a quick sketch below to illustrate these relationships. For a more concrete example, let us have a look at the relationships between ($ABS and $ACR), ($FMETF and $ALI) and ($BLOOM and $BDO); the $ sign is the hashtag used for stock quotes. 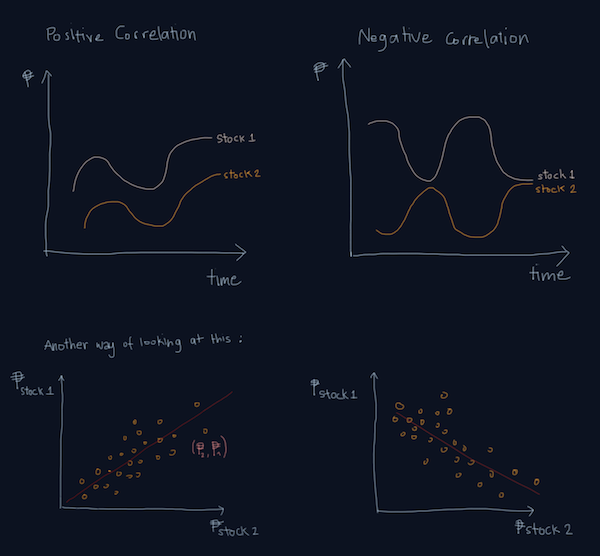 I chose these securities based on the correlation values of the pairs in price_corr. Can you tell which of the pairs are positively correlated? Negatively correlation? Below, we draw the heatmap of the resulting correlation matrix. As mentioned in the blog post, we will use two distance metrics in building the distance matrices. The first metric is from Bonanno et al. This equation does not distinguish between a positively or a negatively correlated pair of stocks; as long as two stocks are highly correlated, the distance is minimized. Here, we define the distance matrices as dist_bonanno and dist_mktstk. Now, we are ready to build the minimum spanning tree. The idea is to connect the ones that have the closest distance to each other, i.e. connect those that are highly correlated. Let's first build the "weighted" networks G_bonanno and G_mktstk from the distance matrices dist_bonanno and dist_mktstk, respectively. Using the Python package NetworkX, that's pretty straightforward to do. Once we have the distance networks, we can already build minimum spanning trees (MST). Here, we use Kruskal's algorithm. Below is the pseudo-code copied from the Wikipedia entry on the algorithm. Again, we can use NetworkX to build the MST with the graphs as inputs. This way, when we draw the MSTs, we can choose to color the nodes by either sector or change. Below, we write the MSTs as gexf files so we can use them in Gephi (open-source and free) to generate much prettier networks/trees. Gephi is the leading visualization and exploration software for all kinds of graphs and networks. 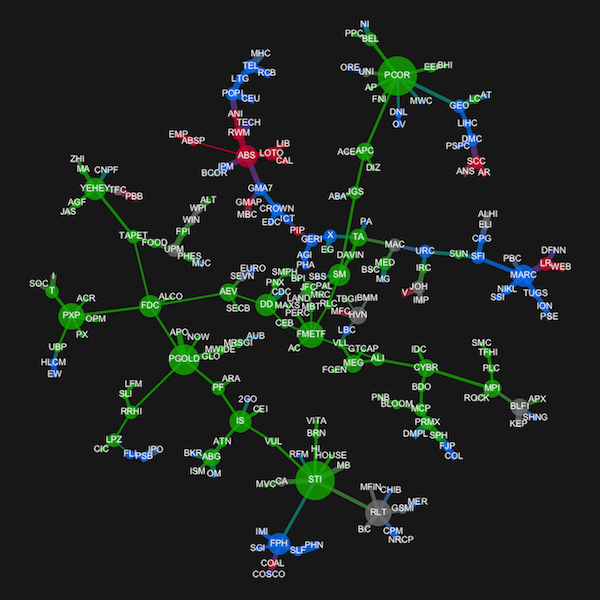 Gephi is open-source and free. Below is the resulting network (MST_b) drawn using Gephi.